The last time we went shopping for a house we spent three years and five failed attempts before we finally bought our beautiful Craftsman house in Portland. 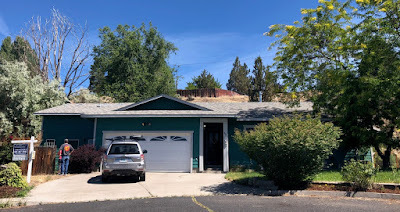 So, this time, I decided I would not write much about our house shopping efforts because it so often went sideways in the offer or escrow period. We are buying a simple little rancher house in Prineville, Oregon. The inspection was Friday and there were no surprises, so there is very little to stand in the way of close at this point. I have to admit, I'm a little freaked out because we're buying the new little house before we sell our beautiful big house in Portland, but I simply can't deal with moving into storage and living out of luggage while we find another. So, we're taking the leap of faith that it will work out. I guess we shall see. Why Prineville? Well, we have a good friend who lives there and it is significantly cheaper to live there. It's rather hotter there than Portland but, in truth, we spend most of our time indoors and we'll be fine with air conditioning. I will do another post with interior photos. The Frankenstein kitchen counter is pretty funny. As usual, we do have plans to do some remodeling, though we have a strict budget and we'll have less grand interiors than we have now. I know I will be sad to leave our big, beautiful house in Portland, but when we bought it we planned to both be working full-time and expected to be more financially able to afford Portland, but we've since realized that's no longer our plan. If we stay in Portland, there's a good chance we'll outlive our retirement assets. I'm hoping by cutting our cost of living to something less than half the present cost will extend the time. I expect our Portland projects to kick into high gear later this year. The current plan is to get the house onto the market next spring. That gives us the winter to get rid of roughly half our stuff. I really should get started now, but I think I'm still in denial. That will be a huge change. Good luck to you! I wish you the best. Your "big" house always seemed too small for how much stuff you have. What a challenge! Agreed. Believe it or not, we used have a house (and garage and barn) even bigger than this one. We've been downsizing for years, but we've sort of lost the momentum and crammed most everything into the basement and ignored it. I'm actually hoping to just move over the stuff we want to keep and get rid of the rest of it while we're still in Portland. Oh my, congratulations on a successful house hunt. Get that "stuff reduction" into high gear and get that Portland house on the market. I hated to leave Portland, in a way but not so much in other ways, but my Portland house paid for my move closer to family and a mortgage free house in Alabama. We never know for sure what the future will bring us but it sounds like your plans are good. Thank you. Sadly, we are moving pretty slow right now and it will likely be next year before we get the Portland house on the market. What do the dogs think of the new place? It looks like their yard shrank, too. I am sure your current house will sell immediately. I agree that it gets tedious after awhile looking for just the right piece to complete a project. But it will be interesting to see how you take a contemporary built home and add Craftsman touches. Looking forward to reading more blog posts....hint hint. I'll likely keep blogging, even after we move, but I may change the name of the blog. I'm sad to see you move but happy that it seems to be the right thing for both of you. If you have any craftsman furniture that is included in that downsizing, let me know! I've only just started by remodeling and still have very little furniture at this point. I bought a 1904 craftsman in Gladstone as I couldn't afford Portland (i'm still a relatively young single guy). Maybe i'll move to Irvington when I marry a doctor! We'll have lots of furniture to get rid of. If you're on FB, you can leave a message for me on the Laurelhurst Craftsman page and we can talk about what you're interested in. How is the air quality in Prineville now? Boy there are a lot of fires burning. None too near Prineville but closer than here and not sure about smoke directions.